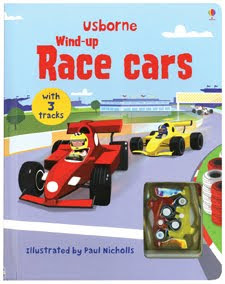 Usborne Books has just released the most amazing set of Beginning Readers. These are available in a boxed set of 15 books and a parent guide. These books are for children who are just beginning to learn to read, or are just struggling along. 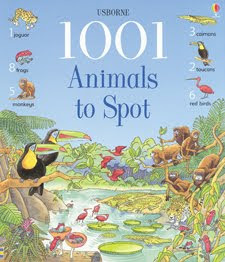 It offers the appeal of imaginative rhyming stories and irresistible illustrations. The support of a well-researched framework and the enjoyment of shared reading with an adult. 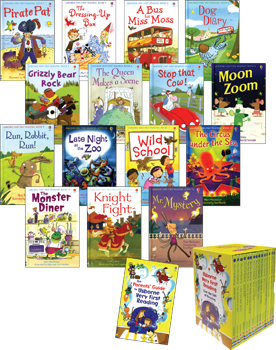 In the first seven books, adult and child take turns reading with the child's share becoming gradually more challenging in each book. 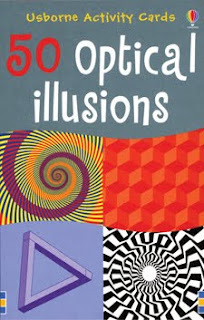 These books cover material that is normally taught during a child's first year of school. Be sure to give your child time to progress from one book to the next. Re-reading helps to build a child's confidence and fluency. There is also a website available that offers puzzles, games, and other activities directly connected to the stories to further practice reading skills. Books 1-7 are: Pirate Pat; The Dress Up Box; A Bus for Miss Moss; Dog Diary; Grizzly Bear Rock; The Queen Makes a Scene and Stop That Cow! Starting with Book 8, the child reads the whole story with the adult providing help and support if needed. 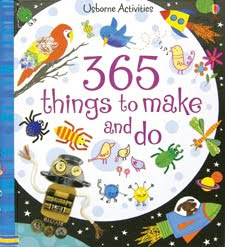 These books explore material that is often taught during a child's second or even the third year of school. Books 8-15 are: Moon Zoom; Run, Rabbit, Run! ; Late Night at the Zoo; Wild School; The Circus Under the Sea; The Monster Diner; Knight Fight and Mr Mystery. 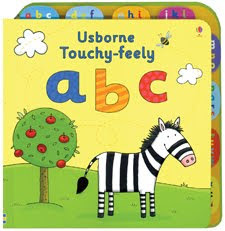 Usborne Very First Reading set is based on the principles of synthetic phonics, which is one of several phonics-based approaches teachers commonly use when teaching children to read. Reading is both the key to success at school and the source of a lifetime’s pleasure. 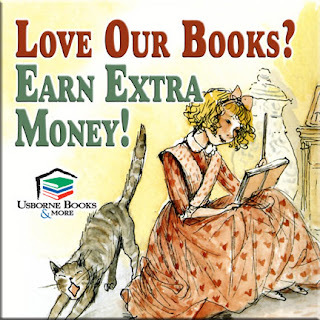 Usborne Very First Reading helps children develop the skills and motivation they need to read with confidence and enjoyment. 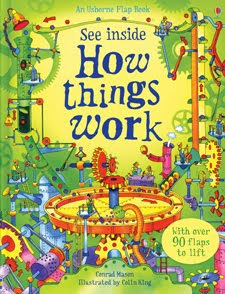 To Order your own set of the Very First Reading Series, go to: http://www.seeinsideusborne.com/ or contact Andrea McConahay, Educational Consultant with Usborne Books at: 801-616-1892 or by email at: Andrea@seeinsideusborne.com. Looking for a Job? Do you love Children's Books? We are always looking for new consultants all over the country! If you love books, love kids, need a night out once in a while, could use some extra income, etc. Why not give Usborne a try? It can fit with any lifestyle, and you have nothing to lose! I can always use help with events to help you get started! Sign up with the link above, or contact me today for more information! Hurled into a life on the run the 15-year-old fugitive is isolated and alone. Hunted by the law and ruthless criminals, Cal must somehow uncover the truth about his father’s mysterious death and a history-changing secret. Who can he turn to, who can he trust, when the whole world seems to want him dead? Any second could be his last. The countdown has begun...12 books. 12 months. Join my monthly bookclub, and order just 1 each month! Great series for any pre-teen, teen, or reluctant reader. ONLY SOLD THROUGH AN USBORNE CONSULTANT!!! Our touchy-feely books are highly popular, and great for creating hands-on, sensory awareness! 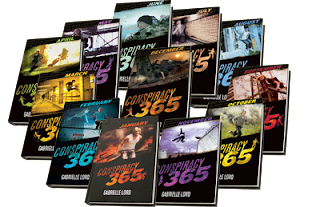 Choose from over 1500 books on my website or email me to know more! Aren't sure what to buy? A little overwhelmed? Just ask for a personal shopping appointment! (I will come to you, bring a few books to show as examples, go through the catalog, and make a few suggestions). Bang, shopping done and you haven't even left your house! I would love to help anyone/everyone, so tell your friends! Also, now booking home shows, so earn all your gifts for FREE! Mention this post and receive an additional $20 in free books the night of your show! Need more variety in your home library? Check out my website above. I am always looking for consultants to join my team!! The opportunities are coming at me left and right and I am always looking for more help! These events will probably provide many leads that I won't be able to fill all by myself. If you or anyone you know might be interested in this type of business, please send them my way!! Don't live in Utah but still interested, no problem!!! I can still help you get started! It is fun, very rewarding, and gets some high quality educational books in your hands! A great way to work towards staying home with your kids, help with the family finances, get out of debt, or save for a rainy day!